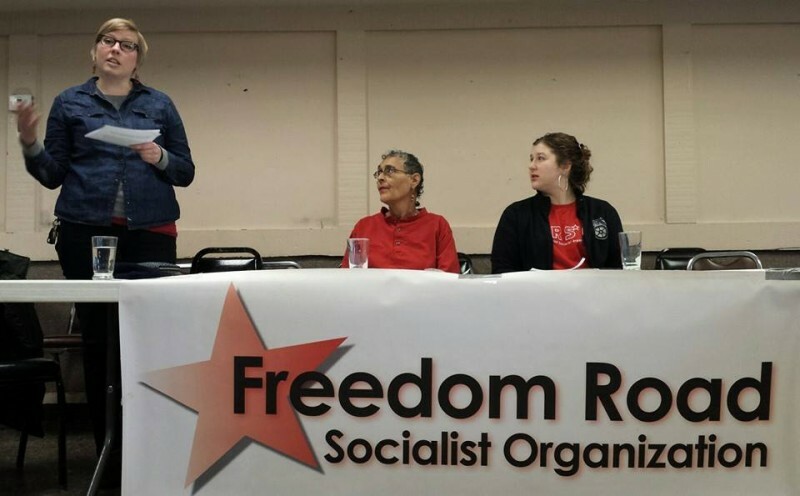 International Women’s Day 2015 celebrated in Minneapolis | Fight Back! Minneapolis, MN – About 40 people came together here, March 8, to celebrate International Women’s Day. The program included speakers from the trade union, welfare rights, student and anti-war movements. Delfina Rojas, who works with the Minnesota Immigrant Rights Action Committee (MIRAc) and other community organizations, spoke about the struggle of immigrant women for equality, against domestic violence and for an end to deportations. To finish out the program, Angie Citlali performed a powerful song dedicated to the 43 Mexican student activists from the Ayotzinapa rural teachers college who were disappeared and almost surely massacred by the Mexican state last September. The song makes connections between students here in the U.S. and in México.